This cheesecake may be the richest and most delicious dessert I have ever tasted – but let’s get back to that in a second. 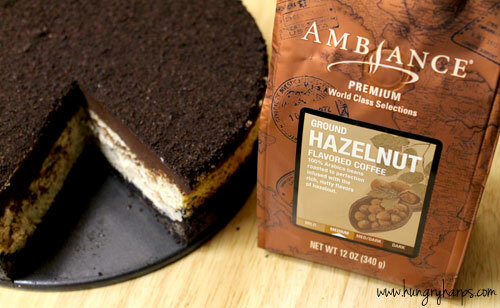 First, let me tell you about the inspiration for this dessert – Smart & Final’s Ambiance coffee. We are HUGE coffee drinkers in our house, I am talking between a pot or two of coffee a day, so when I find out about a coffee I have not yet tried – I jump on the chance to get it brewing in our coffee maker. When I found out that Smart & Final had their own line of coffees, named Ambiance, I couldn’t drive to their store fast enough. Smart & Final has two brands I am already in love with, First Street and La Romanella – so I was sure their Ambiance coffee was going to make me an instant fan as well. Ambiance does not only have a line of delicious coffees, but they also have soy milk, coffee creamer, coffee filters, coffee toppings, sugar and a sugar substitute. How awesome is that? When I got to the store the first thing I looked for was the Ambiance coffee, and when I found it I was pleasantly surprised to see they carried my favorite flavor, Hazelnut! I grabbed a bag of it without hesitation. Then I checked out their other flavors for Mr. Hungry Harp – he is less of a flavored coffee type guy, he likes his coffee dark and strong. I chose the Kona Style blend for him, simple and no frills. 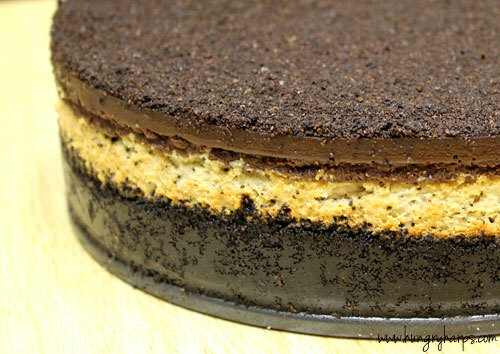 ;) After picking out a couple coffees to try I set out for the ingredients I would need to make the cheesecake of a lifetime – and lucky for me, Smart & Final had everything I needed! Check out everything I found on my trip to Smart & Final here on Google+. 10. Refrigerate overnight or until ganache is set. Anyone who decides to give Smart & Final’s Ambiance coffee a try in the next 3 weeks can go to www.smartandfinal.com/Ambiance2012 and enter a code on the receipt from their purchase of Ambiance and be entered to win some awesome prizes including a DeLonghi BCO264B Cafe Nero Combo Coffee/Espresso Maker and $50 SmartCash cards. Check it out!! YUM! The crust sounds so good, I think I could eat that on its own! Yes, yes and yes for sure! This looks like it could be one of my faves and I love pretty much anything hazlenut. Gorgeous!! You're killing me! Could it be any more delicious? This looks fantastic - all my favorite flavors in my favorite kind of cake. Sigh. 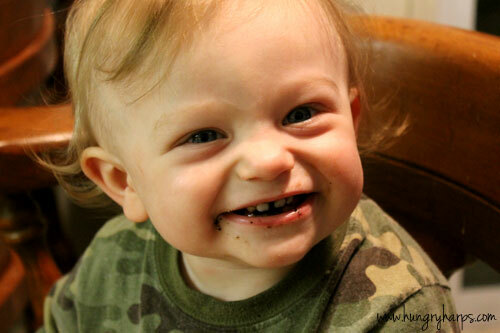 I think the little man loved it from his smile. This looks so good. Oh my! 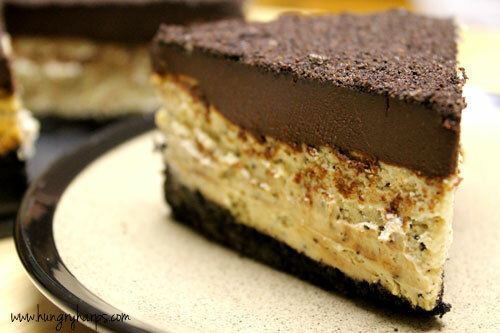 ♥ coffee, and with hazelnut AND cheesecake?!?!?! I am SO giving this recipe a try! Curious about the "crumb topping". Did you just reserve some of the crust mixture (sans butter) ? Btw, this looks delicious.